Why Kellyanne Conway’s couch posture offends Trump opponents. Kellyanne Conway’s Couchgate! An Analysis. Counselor to the President Kellyanne Conway checks her phone on February 27, 2017 in Washington, D.C.
Let us begin by stipulating that Kellyanne Conway’s couch posture is not a story. But the scandal that gained traction was not DeVos’ erasure of racist policies from the story of American education. It was not the exploitation of black college presidents to burnish Trump’s image. It was the fact that Conway plopped her knees and heel-clad feet on the pale golden upholstery of a presidential davenport and proceeded to scroll through her phone while her boss and his guests remained in the room. My stars! 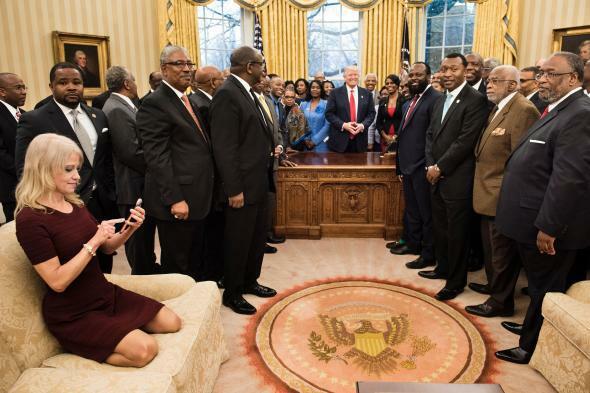 In defense of Conway, it appears she’d climbed atop the couch to improve the angle on a picture she was taking and failed to readjust her foot and leg situation once she’d gotten the shot. The critiques of her etiquette, I think, can partly be explained by the outrage some proportion of the American electorate feels when it believes the White House’s occupants don’t deserve to be there. Consider that the newly elected President Obama drew criticism in 2009 after meeting with staffers in the Oval Office without his suit jacket on. (Meanwhile, the president’s supporters welcomed signs of a “more informal culture” at 1600 Pennsylvania Avenue.) Likewise, a viral photo of the newly minted executive with his legs on his desk charmed Democrats and horrified Republicans. Those on the left saw an unpretentious man of the people settling into his authority. Right wingers saw an arrogant act of desecration. Kellyanne Conway takes a photo on February 27, 2017 in Washington, D.C. But Obama also represents an instructive foil for Conway, if only because he showed such sensitivity to decorum throughout his tenure. In their public and private lives, the previous president and his family repelled disgrace like eucalyptus oil repels mosquitos. They did so in part because they had to, because people of color in the White House answer to more exacting standards than their white counterparts. 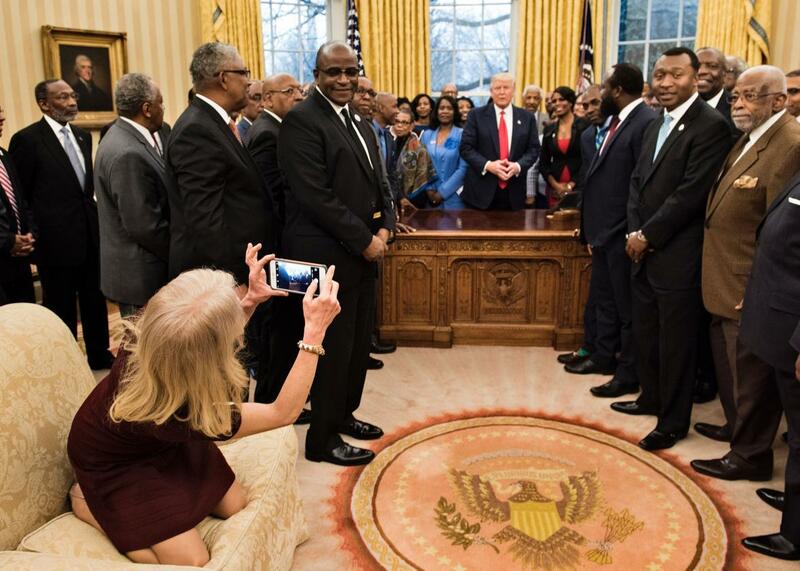 The photo of Conway set Twitter’s counterfactual imagination in motion: How would the world have reacted, multiple users mused, if Michelle Obama or Valerie Jarrett or Condoleezza Rice had been captured playing on the furniture while the leader of the free world hosted three dozen white constituents? I suspect the Conway photograph offends a lot of liberals because it strikes them as a metaphor. Trump’s administration, not to mention its alt-right fan base, delights in performative norm-breaking. The president and his staff trample basic niceties with their false statements, unconstitutional bans, and conflicts of interest. And this impunity seems connected, in a slippery way, to whiteness, aligned with the narrative of a casually racist administration playing fast and loose with our democracy. Then again, maybe the camera just caught Conway at a bad moment. Maybe the sticklers are overreacting. Maybe we should stop recruiting neurons into an analysis of this person’s knees vis a vis a fancy ottoman and instead devote a little time and energy to figuring out why Steve Bannon looks like a disheveled runaway on the hunt for a nap.